Iberian ribbed newt on land. Defensive behaviour of Iberian ribbed newt. Left: The newt's sharply pointed rib tips stick outside its body (indicated by arrows). Right: The arrows point to a poisonous, milky substance secreted onto the skin surface. F. Leydig, a German zoologist and comparative anatomist, noted the Iberian ribbed newt’s ability to expose its rib bones for the first time in 1879, but little was known about the exact mechanism of this antipredator adaptation. In 2009, a group of Austrian scientists, Heiss et al., managed to shed some light on how the defense mechanism of Iberian ribbed newt really works, using photo- and X-ray imaging along with computed tomography techniques. Heiss et al. simulated a predator threat by touching the newts repeatedly using a cotton bud, inducing the self-defense behaviour. Comparison between X-ray images before and after the simulated threat shows that the animals rotated their ribs anteriorly, as shown in the pictures below. The forward movement of the ribs increases the body size, causing the sharply pointed rib tips to lacerate the skin and protrude outside the body like exposed spines. Each newt is able to swing its bones forward because its long ribs are attached to the backbone by a flexible two-headed joint. It was revealed in the same study that the ribs are not projected through permanent pores located on the skin, but instead the self-inflicted injuries occur de novo each time. Meanwhile, to add into the already complex defense mechanism, the newts also actively secrete poisonous, milky substance onto their body surfaces, coating the tips of the ribs as they are projected out of the body, turning them into highly effective and potentially deadly weapons. Radiograph showing anterior rotation of ribs from before (a) to after (b) a mildly threatening stimulus of the same animal. (c,d) Schematic drawings of 8 vertebrae (numbers 4-11) with corresponding ribs, pointing to the differences in rib angle relative to the sagittal body axis before (c) and after (d) stimulus. What is surprising is that the Iberian ribbed newts are not injured in the process. The combination of their extraordinary capacity to heal skin injuries, the presence of antimicrobacterial peptides released from specialized cutaneous glands (Schadich, 2009) as well as the immunity against their own toxin, similar to some other species of urodels studied by Edmund Brodie, Jr. and Linda Gibson (1969), is believed to serve as a shield against infections and self-poisoning. 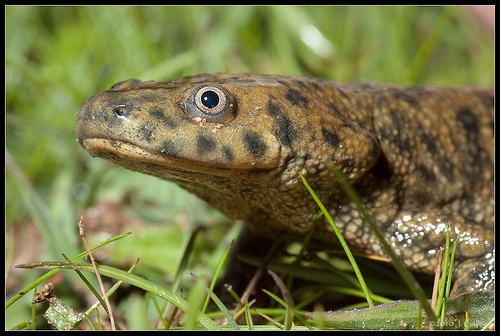 Besides P. waltl, there are other species in the Salamandridae family using this type of defense mechanism. 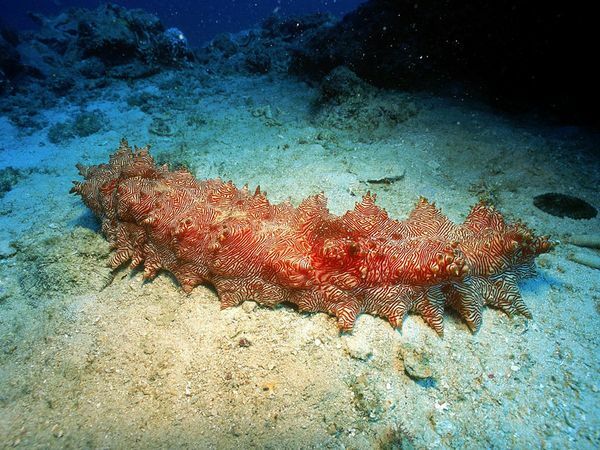 For example, Echinotriton andersoni, a species belonging to a sister genus of the Pleurodeles, also use the ribs as “concealed weapons” to defend against predators. Detailed study on E. andersoni can be found in the paper by Brodie, Nussbaum and DiGiovanni (1984). “Pleurodeles waltl,” by J. Gallego. Flickr. URL: http://www.flickr.com/photos/javig/4465950862/ (accessed on 8 April 2010). “Bizarre newt uses ribs as weapons,” by Matt Walker. BBC Earth News, 21 August 2009. URL: http://news.bbc.co.uk/earth/hi/earth_news/newsid_8212000/8212623.stm (accessed on 8 April 2010). “Newt Cuts Itself to Use Ribs as “Concealed Weapons”,” by Scott Norris. National Geographic News, 28 August 2009. URL: http://news.nationalgeographic.com/news/2009/08/090828-spanish-newt-ribs-spines-wolverine.html (accessed on 8 April 2010). Brodie, E.D. Jr. & L.S. Gibson, 1969. Defensive Behavior and Skin Glans of the Northwestern Salamander, Ambystoma gracile. Herpetologica, 25(3): 187-194. Brodie, E.D. Jr., R.A. Nussbaum & M. DiGiovanni, 1984. Antipredator Adaptations of Asian Salamanders (Salamandridae). Herpetologica, 40(1): 56-68. Heiss, E. et al., 2009. Hurt yourself to hurt your enemy: new insights on the function of the bizarre antipredator mechanism in the salamandrid Pleurodeles waltl. Journal of Zoology, 280(2): 156-162. Schadich, E., 2009. Skin peptides activity against opportunistic bacterial pathogens of the African clawed frog (Xenopus laevis) and three Litoria frogs. Journal of Herpetology, 43(2):173-183. Apocrita, one is prey to another. The average size of bees can vary from 2.1mm to 39mm, while hornets can grow up till 55mm in length. Judging from their physical sizes, one can almost infer about the predator-prey relationship between these two species. Yes, it is well-known that hornets do attack bee colonies. What are the hornets after? Bee grubs. Simply said, the baby bees, which look like those little, but fat white maggots. The hornets are after food for their own grubs, feeding the bee grubs to those of their own. With just 30 hornets, 30000 bees can be decimated a short time of one hour. Being attacked by creatures which can grow up to 3 times their size, most would say it is a scene of bee massacre because each bee will defend the nest on its own effort. There is no strategy or team-work whatsoever. Not so for their cousins from the land of the rising sun in Japan. The Japanese bees have developed a defense-mechanism to deal with hornets. While conventionally, army bees will defend the entrance of the colony in face of an attack by the hornets, the Japanese bees will lure a single hornet which happen to ‘stumble upon’ a particular Japanese Bee nest. They do this by not standing against the hornets at the nest’s entrance, but let the hornet into the nest after the hornet has left its signal at the nest. Once a hornet is sighted, the Japanese bees will swarm together and use their body language to forward the message to other bees in the nest to prepare for an impending attack. It is interesting to note that the Japanese bees do not fight the hornet in a “fire against fire” manner. While European bees will stand against hornets and use their stings and jaws to hurt the hornets, the Japanese bees amass themselves around the attacking hornet. They envelope themselves around the hornet in a ball of bees, while vibrating among themselves in order to increase their own body temperatures. In just 15 minutes, the hornet will be ‘roasted to death’ because bees can withstand and upper temperatures limit of 47 degrees Celcius very quickly using their flight muscles, while hornets can only withstand an upper limit temperature of 44-46 degrees Celcius. This also illustrates the significance of working as a team against larger, and stronger predators. A video below documents this manner of the Japanese bees’ evolved-defense against their natural predators, the hornets.